This introductory workshop is a new writer's best self defense guide. Included in this two and half hour intensive are: methods for dealing with writer's block, rules of selling and/or producing your screenplay and a clear and effective plan to help complete your screenplay and format it properly. This workshop is specifically designed for those who are finding trouble getting started or completing their script. This workshop focuses on concept to first draft. Eat, Drink and Network! We have a lot of successful alumni and I invited some who recently released their films and TV shows in Theaters, Film Festivals, Netflix and Amazon to come and have lunch with you. We will also have a few industry executive and content buyers in the room, so have those pitches ready. 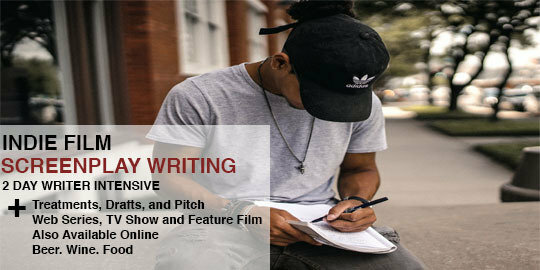 Free to all Writer and Producer students. Take the online version of our New Screenplay Writer workshop. We will send a link to the live video and the tweeter feed so you have you question and comments answered in real time. You will also get a link to download slide presentation and handouts. This workshop is most fun when shared by others, so we encourage you to invite a couple of friends over split the costs and BYOB!